Said and Hodan didn’t know each other in Somalia. But when their country’s bloody, ongoing civil war began in 1991, both of their lives were at risk simply because of the clan they were born into. They separately fled Somalia to a refugee camp in the neighboring country of Djibouti. That was where they met, fell in love, and married. As refugees, the couple led a difficult life in Djibouti. 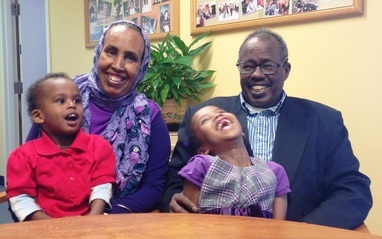 They didn’t want their plight to be their children’s fate, so when they learned that their children could never enroll in school due to their refugee status, the family applied for relocation to a third country. The family finally arrived in Chicago in November 2012. After 17 years of 100° temperatures in Djibouti, Chicago felt bitterly cold. Said arrived dressed in a t-shirt. “I froze,” he said. But Said and Hodan vividly remember the warm welcome they received from RefugeeOne. Their case manager was waiting at O’Hare Airport with winter coats, gloves, and hats. He drove them to their newly-furnished apartment where a delicious Somali meal was waiting. The next day, Said and Hodan were brought to RefugeeOne to begin English classes and enroll in the employment program. Hodan secured a job cleaning hotel rooms and brought an important early income for the family. RefugeeOne helped Said find work as a dishwasher soon after. Said and Hodan came here for their children, so they were dedicated to accessing every RefugeeOne service to ensure their children’s success and happiness. Their four children became enthusiastic participants in RefugeeOne’s after-school program and continue to receive home tutoring each week. The results? The two oldest girls brought home a dozen As and Bs on recent report cards.